Chrichton's World: Review Self/less (2015): More than just a thriller with action and thrills. Review Self/less (2015): More than just a thriller with action and thrills. 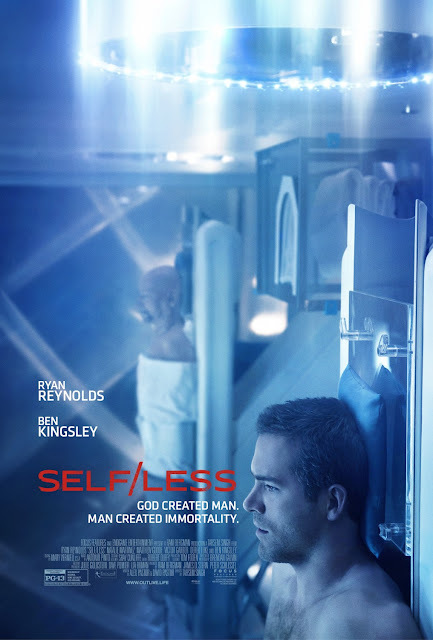 To be honest I was very skeptic of Self/less before I watched it since the trailer seemed to indicate that this was going to be very similar to another film Ryan Reynolds was starring in dealing with the same theme. But where Criminal was more focused on the action Self/less is more interested in the human aspect of the premise and the consequences. Therefore far more interesting and compelling. While Self/less could have gone far deeper into investigating the ramifications of certain medical applications and operations it does raise some interesting philosophical and ethical questions. Don't worry there is very little to no technical or medical mumbo jumbo to confuse or distract the viewer. Most of the impact of the film will be very basic and emotional so that anyone can relate to it. I really have to credit Tarsem Singh for focusing on the issues that matter the most but still leaves room open to for you to form your own thoughts. Of course he does direct you into a certain direction but had he not done so the film would have lost a lot of it's impact. The cast should also be commended for taking everything seriously and portraying their characters as real human beings and not talking plot points like in Christopher Nolan films. Both Ryan Reynolds and Ben Kingsley are on their best. I would not have minded for Kingsley to have been longer in this but then again he does so much in the little time that he is given. Plus he seems to really put have some effort into this role unlike the one in Security. Matthew Goode also is faring much better than his last stint in The Hatton Garden Job as he has a real knack to play mysterious figures. Self/less does have some twists and turns but most likely won't surprise you as much but that is fine since like I said the focus lies on the dramatic impact and not the thrills. Despite the shift in focus there are enough scenes where your adrenaline will get pumped. Up until the credits I wasn't aware that this film was directed by Tarsem Singh. But in case you were and are hoping to expect his flair for out of this world visuals and style I will have to disappoint you. He very wisely decided to keep things as low key as possible to avoid being distracted. Overall Self/less is really worth your time and a must watch if you ask me.